Last Friday morning came early with a 3 a.m. alarm for 75 Encinitas community members who joined the “We All Count” homeless census. Our task was to get a comprehensive count of the number of people living unsheltered on the streets of Encinitas, Rancho Santa Fe and Solana Beach. My husband Jeremy and I were assigned to the same census tract as last year, which included parts of downtown Encinitas and some coastal areas. We saw two cars with people sleeping in them, one person’s legs protruding from bushes at a beach overlook spot and one person sitting upright with eyes closed on a bench in a brightly lit area of downtown, with belongings nearby. It’s too soon to learn the results of the entire census, but our group of three saw fewer people than last year. Every time I saw someone and imagined having to sleep scrunched into a car, upright on a bench, or on the cold, hard dirt with inadequate clothing, my heart would sink. There is real urgency about the need to help prevent this and move people off the street and into a home. This annual census utilizes lay volunteers like me to count the number of people on the street; those with more training do follow-up interviews with some of them over the next four days. The count determines federal funding formulas for each region. After last year’s Point in Time count, the national organization said that their “…data documents important progress in ending homelessness for families with children, …stalled progress for Veterans, and significant increases for people with disabilities who are experiencing chronic homelessness. These results appear to have been impacted significantly by limited [housing] supply and increasing rents…” You can read their report here. At the City of Encinitas, we’ve alotted more than $100,000 a year to the Community Resource Center for a “housing navigator” to help people access services and find housing. This navigator’s work resulted in more than 20 homeless Encinitas people finding a home. Although we don’t yet know this year’s results, I’m hoping that our housing navigator and the opening of three large tents that house 700 people in downtown San Diego have decreased the number of homeless sleeping in Encinitas. Here’s the Union-Tribune article about the 2018 count. 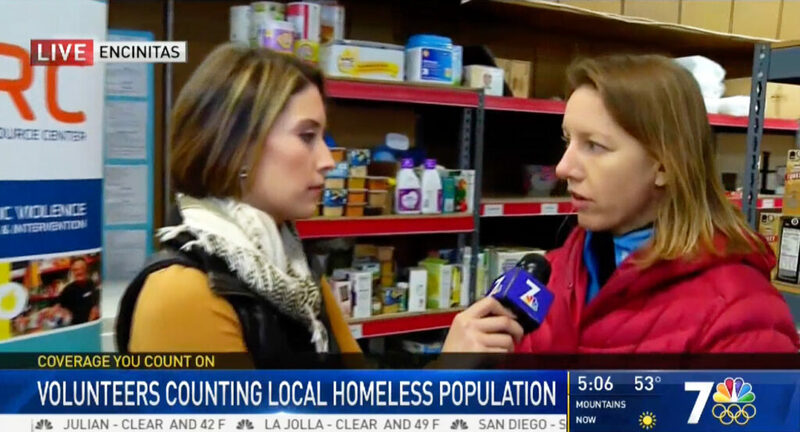 KNSD News followed my volunteer group around on the night of the homeless count and spoke with me at the Community Resource Center about the census. You can watch their video news report here. All five elected members of the Encinitas City Council also serve on outside boards around the county. I’m a board member of the Encina Wastewater Authority, which processes wastewater from sinks, showers and toilets. The facility collects it, treats it and turns some of the water into recycled greywater that is distributed to golf courses and medians through “purple pipe,” and pumps the rest of the treated water one-and-a-half miles into the ocean. Every two years this “ocean outfall pipe” is thoroughly checked. At this week’s board meeting, the staff presented a short video showing that its in great shape, and the area surrounding the outfall pipe is in a healthy condition. It’s a really interesting five-and-a-half-minute video explaining this process, and you can watch it here. It’s good watching for anyone interested in infrastructure, what government does, how clean water is processed, and what your utility bills pay for. One emerging opportunity for wastewater treatment plants is exploring how they can help cities better process green waste – food and plant material – to keep it out of landfills. Encina is beginning by processing a substantial amount of brewer’s waste from Stone Brewery in Escondido, which arrives to Encina’s facility as a thick sludge. This is an exciting development that I hope will lead to more opportunities for local management of green material. In the last decade in this county we’ve seen lower population growth, slower income increases and lower inflation than what was predicted by SANDAG in 2004. This means that over 40 years, less money will be generated from this sales tax than originally predicted; closer to $19 billion instead of $39 billion. (This is not related to the SANDAG forecasting error on the failed proposal for a new tax that received a lot of attention several months ago). Caltrans construction costs have been spiking since 2012. I questioned this at the board meeting but didn’t feel satisfied with the answer – it was presented as relating to rising material costs and rising construction costs from contractors during a good economy. This remains a concern. Just a quarter of the way into a 40-year sales tax TransNet program, 61% of the 48 major capital corridor construction projects are complete or in progress. That’s a good thing. The final analysis is that it’s reasonable to expect that the promised TransNet goals will be delivered in the 40-year timeframe. But SANDAG must be vigilant, given the uncertainty of long-term revenue, rising costs, and the challenges of transitioning to a pay-as-you-go approach from the earlier debt-financing strategy that allowed for project acceleration during the down economy. Here’s the San Diego Union-Tribune article. Also, the search continues for a new executive director at SANDAG. I volunteered to sit on the selection subcommittee.The selection of the top staff person at this agency is among the most important decisions that I’ll make as a board member. It’s critical that this person have demonstrated leadership and strategic experience managing a transportation agency that spans multiple modes of transportation. We need someone with both a roads and transit background, not exclusively one or the other. Please weigh in on what you’d like to see in the new SANDAG executive director by completing this brief survey here. o The city and the Senior Commission are seeking to engage more “boomers” in their programming and they’re doing a survey to assess what additional activities or opportunities interest boomers. (You’re a boomer if you’re at least 53 years old.) You can participate in the survey here. o This week the main item on our City Council agenda was the appeal of the Planning Commission’s unanimous approval of a large assisted-living complex off Manchester Avenue. The item was pulled for the two sides to discuss a potential compromise (always a good development), which left us with a few items on our consent calendar, plus more than an hour of public comments, most of them housing-related. The Coast News article on the senior housing project is here. o The City Council doesn’t meet for the next two weeks, so you’ll likely get a break from this newsletter during that time. I’ll be attending the annual SANDAG retreat at the Barona Resort and Casino in Lakeside. Having the opportunity to hear county-wide presentations and have informal conversations with the leaders of other local cities is really valuable information sharing. o And in another in a series about my American-history/Broadway musical obsession, Hamilton‘s three week run in San Diego ends today. I was fortunate enough to see the show three times while it was in Southern California. I’m considering a Hamilton-themed club (details to come) and anyone with solid Hamilton knowledge is invited. To join us, you should know something about the Hamilton musical, America’s founding fathers, the Revolutionary War, or ideally all three. The club events may include performative components and/or team-based knowledge competitions or even a Hamilton-trivia scavenger hunt. If you’re interested, please reach out to me (you can reply to this letter) and I’ll put you on my ever-expanding list of Hamilfans of all ages! 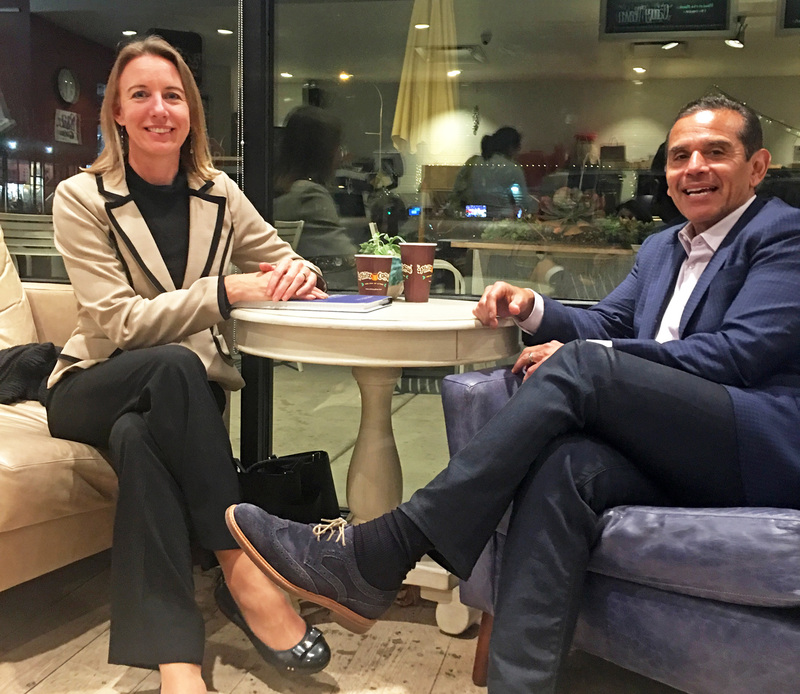 I recently had coffee with former Los Angeles Mayor and candidate for California governor Antonio Villaraigosa. He’s meeting with officials throughout the state to discuss issues and his candidacy. It was an enjoyable and productive conversation! Previous Post1/21/18: Encinitas Now Has the Most Ambitious Climate Action Plan in the RegionNext Post2/18/18: Bring on the Granny Flats!